Ever wanted to star in the movies? Of course you have, but not all of us are blessed with Clint Eastwood's chiselled chin, Marlon Brando's acting talent or Megan Fox's, er, looks. YooStar hopes to rectify this – a new game which has the technology and the rights to pop you into your favourite movies. 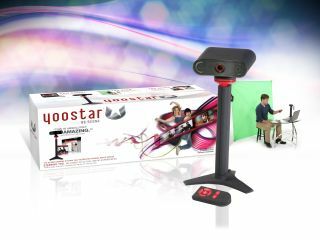 Calling itself "the Guitar Hero" for movies, the games package is created by a US start-up (also called YooStar) and contains a greenscreen, a high-res webcam (with microphones and remote control), stand and software. Five studios have allowed some of their clips to be used in the game – these are Paramount, Universal, MGM, Warner Bros. and Lionsgate. Some of the movies included are The Terminator, Sunset Boulevard and Rocky Balboa. Just like Guitar Hero, you will be given a starter pack of clips, then will be able to download more. So far, YooStar is only pencilled in for a US release in August – costing $170. While there's no word on a UK release, it will be interesting if someone like Microsoft buys the rights to the new game. It already has You're In the Movies out for the Xbox 360, which is a game made in the similar vein, but without the big-budget movie clips. What this does mean is that there is already a user base for this type of game and marketing money just waiting to be spent.